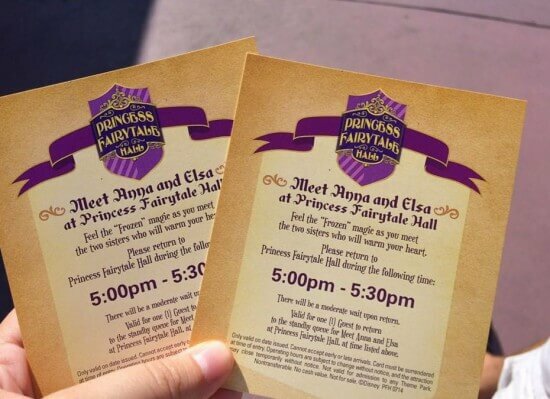 The Magic Kingdom is fixing the ever-so-long lines to see Anna & Elsa. At times the wait time to see these two is as long as 4 hours, causing guests to get upset as they waste most of their time in the park waiting in line to do just one thing. This week the Magic Kingdom is running a new test with the sisters that would shorten the line to about half an hour. At the beginning of the day, cast members will allow the line to build up to about a 30-minute wait and then cut it off. 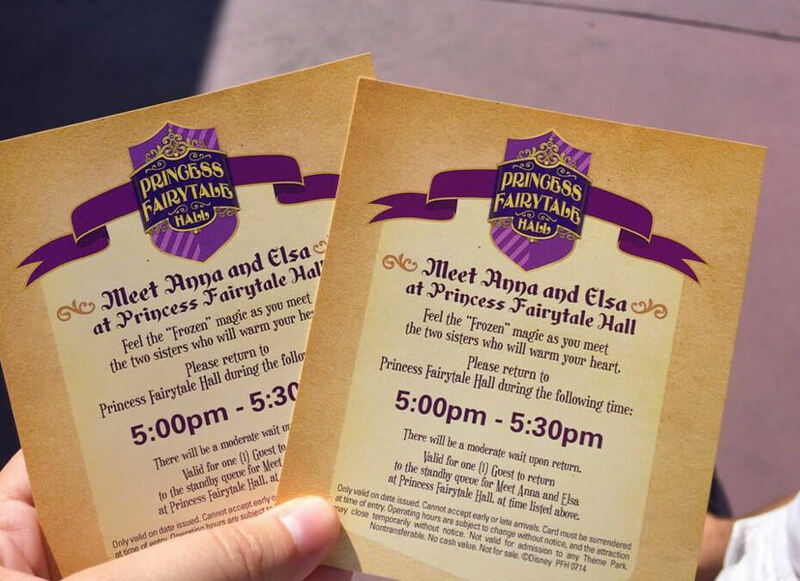 Any guests beyond that point, or who show up after they have cut the line off, will receive a timed-return ticket, allowing the guest to come back at a later time for their meet and greet. Here is what the return tickets look like, given by WDW Press. Each hour of the day approximately 80 tickets will be given to guests. This is the number of guests the princesses can see in 1 hour and keep the half-hour wait times. This new process will allow guests to enjoy more of the park during their visit. It is in the testing phase for now but could easily become part of the daily operations. If you are planning a trip to Walt Disney World, please contact me for more information. Posted on July 25, 2014, in Announcements, Disney Characters, Walt Disney World. Bookmark the permalink. 1 Comment. I like this idea! We booked early Fastpasses for them, but if we’re planning an impromptu trip or decide to see them an extra time, this is definitely a service I would love to see used!